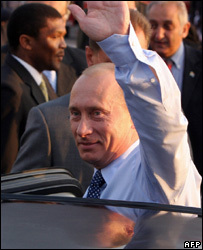 Russian President Vladimir Putin has pledged to boost business ties with South Africa on a landmark visit. He said economic ties between the two nations, both with vast mineral and diamond reserves, lagged far behind the political affinity they enjoyed. "The decades-long interruption in ties between South Africa and Russia is now history," Mr Putin said. This is the first trip by a Russian president to the country. Moscow once aided South Africa's current leaders. South Africa's ruling party, the ANC, received military training and financial support from Moscow during its many years of fighting apartheid. But since the party took power 12 years ago, Russian influence has waned. And the BBC's world affairs correspondent, Peter Biles, says Russia is now conscious of growing Chinese interest in many areas of sub-Saharan Africa. Mr Putin held talks on Tuesday with South African President Thabo Mbeki. Dozens of business leaders in his delegation were also expected to meet their South African counterparts during the two-day visit. "We should not only get absorbed in sentimental reminiscences of the past but also get involved in ways to enhance our co-operation in the future," Mr Putin said. "We have a lot of catching up to do," he said. "The level of our economic co-operation is totally out of line with the political trust and confidence we've had over recent years. He said Russia and South Africa "are planning big projects worth billions of dollars". Investments being discussed include diamonds, mining and metals. Mr Putin is being accompanied by some of Russia's most high-profile business leaders. Two of the world's biggest diamond firms - De Beers of South Africa and Russian company Alrosa - are expected to sign an agreement. Other topics on the agenda of talks between Mr Mbeki and Mr Putin include health care and space exploration, which South Africa is keen to become more involved in. Mr Putin said Russia and South Africa had very similar approaches in foreign policy issues. Though business ties were the focus of the current visit, the Russian leader said he could not conceal a desire "to see more co-operation in the military sphere". During his state of the nation address in May, President Putin said he wanted relations to improve between Russia and Africa. Many former ANC activists, including President Mbeki, underwent military training in the Soviet Union. Mr Putin is expected to be given a tour of the prison on Robben Island where former President Nelson Mandela spent 18 years as a prisoner of the former apartheid regime. The Russian leader is expected to travel to Morocco later this week.